Ronda Rousey found herself in trouble yet again at the hands of Becky Lynch who invaded WWE RAW during a match. Becky Lynch attacked and left Natalya incapacitated, as she returned to the ring to demand that her match against Ronda Rousey at WrestleMania 35 be reinstated. However, WWE authorities kept their promise from last week, and Lynch was 'arrested' and taken away. Ronda Rousey called out Vince McMahon in the ring, and when Stephanie came out she demanded that the match be reinstated, with quite the ambiguous statement in the middle of the ring. Becky Lynch won the WWE Royal Rumble, and immediately on the WWE RAW episode following the pay-per-view, she announced her intentions to face the RAW Women's Champion Ronda Rousey at WWE WrestleMania 35. However, a suspected injury to her leg saw both Triple H and Stephanie McMahon ask her to get her leg checked out. While Lynch attacked them both, given a condition to apologize or lose the match against Rousey, she made the apology. However, Mr. McMahon was having none of it. 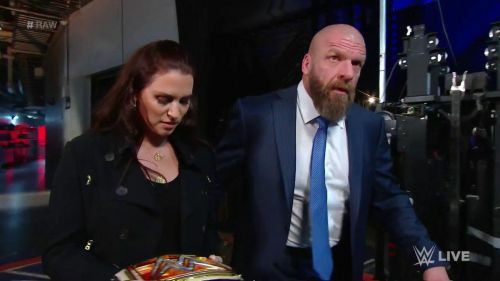 Vince McMahon came down to the ring and said that Becky Lynch was disrespectful and did not deserve the chance. Instead, he announced that Charlotte Flair would be taking Becky's place. The last few weeks have seen Ronda Rousey has been at the wrong end of attacks from Becky Lynch, who wanted her match back. Following her attack this week, while she was taken away by the police, Ronda Rousey had enough. She demanded that Stephanie reinstate Becky Lynch and drop the charges against her. However, Stephanie McMahon refused. Seeing that she had no choice, Ronda Rousey dropped the title at the feet of Stephanie and told her to ask her father to make the right decision. It appeared she relinquished the WWE RAW Women's Title unless she gets her match against Becky Lynch at WrestleMania. Ronda Rousey might have threatened to leave her title unless she gets the match she wants. Given Ronda Rousey's popularity, WWE might be forced to give her and Becky Lynch the match that they want. This is all leading to Rousey facing Lynch at WrestleMania 35 in one way or another.